Backpack Info, before you buy a backpack, better read our tips. 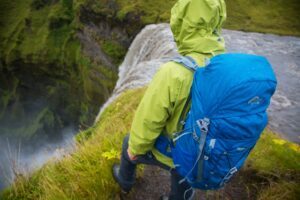 Backpack info – Everything you ever wanted to know about backpacks and then some. Once upon a time “knapsacks” came in two styles: army or council workman. The bigger army style pack with an external steel frame was for camping and mountaineering, whilst the smaller workie’s bag was ideal for sandwiches and a thermos of tea on a day hike. Both were made from heavy canvas with unpadded shoulder straps and both doubled their already considerable weight when exposed to the rain. Carrying comfort was a matter of seeming indifference to manufacturers and people added their own homemade padding in the form of cloth or sheepskin to ease the rubbing and pressure. Rucksacks now come in all shapes and sizes and are now designed more specifically for different activities. 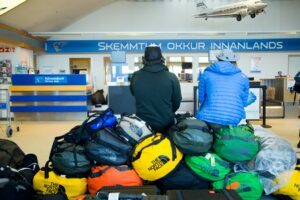 Climbing packs are slim for ease of movement on vertical terrain, travel packs are designed to survive airport baggage handling and public transport baggage racks. The perfect bag for you will match your capacity and activity requirements as well as conforming to the shape and size which best suits you and with the biggest brands represented in our range, Osprey, Lowe Alpine, Deuter and the North Face, there’s plenty of choice too. Most rucksacks or backpacks are made from some form of nylon or polyester. Both work well being light in weight and giving a degree of weatherproofing and durability. The thicker the material the heavier and more durable the pack will tend to be. This can be improved to an extent by using materials like ripstop nylon which are very light and is woven in such a way that tears and abrasion damage to the fabric are limited. This is more expensive and is usually found on higher end packs where weight is absolutely critical. Shoulder pads and back panels may incorporate polypropylene or other wicking fibres to try to keep the back from becoming too damp from perspiration and dry off quickly. A variety of foam types; closed cell, open cell and pre formed are used to provide comfort and padding in contact areas and some packs feature the ability to mould the shape of the hip belt to better suit an individual wearer. At the simplest level a cheap day pack would feature a back “system” comprising two shoulder straps. A better day pack might have a firmly padded back as well and a more deluxe day pack would have some form of ventilation system incorporated into the back. Most quality rucksacks from about twenty five litre capacity and bigger have some form of internal frame. This distributes the load and protects the wearer from sharp objects poking into their back. The bigger and better the rucksack the more likely it is to have a hip belt to relieve pressure from the shoulders and redistribute weight to the legs. Larger and more technical packs are also likely to have a chest strap to relieve pressure and enhance stability. Travel and backpacking rucksacks often have an adjustable back harness which allows the user to match the pack to their ideal back length. These systems all add a little more weight to the empty rucksack but this is compensated for by the improved, stability, comfort and ease of carrying. If you are planning to walk the Appalachian trail, trek across the Alps or traipse around Australia and South America for a year then this is definitely worth considering. Generally travelpacks are large capacity rucksacks 60 to 120 litres. Beware getting one that is big enough to hold everything because you may well end up packing too much to carry comfortably for any great distance. These packs feature a fold out protective cover for the shoulder straps and hip belt. This prevents damage to the harness from straps getting torn off or cut in baggage handling. When everything is stashed away these packs, unsurprisingly look like a large nylon suitcase. Travelpacks usually zip open for ease of access and internally may have stash pockets for small items and straps to hold clothing in place and help keep the contents organised. Sometimes these come equipped with a separate zip-off day pack for day trips and sightseeing where you may wish to leave your main pack back at the hostel or in left luggage. Better travelpacks feature adjustable back systems and possibly a ventilated area. These may add some weight but the extra comfort makes them well worth having on a pack which will spend a substantial amount of time being carried around on your back. When purchasing spend some time getting these fitted to suit you before you leave the store. If travelpacks are the urban people carrier these would be the four by four off roader of the rucksack world. Capacity is 60-120 litres. They are ideal for multi day camping trips where all your food and gear has to be carried. Harness systems generally are high quality with hip belts, chest straps and padded and vented backs as standard. The emphasis here is on stability and load carrying across rough ground. Trekking packs are taller and less square than travel packs to keep the load as close to the spine as possible and are designed to offer as much freedom of movement as is possible under a heavy load. Nowadays almost all expedition packs feature an internal frame and adjustable back length and all have front and side compression straps so that the load can be kept taut and equipment such as trekking poles or ice axes can be attached to the exterior of the pack for convenient access. Fabrics can vary but mostly these are made from heavy duty nylon and polyester. There are some ultra light versions available in in thinner lighter fabrics but these are for those for whom every single last ounce counts as the downside here would be a noticeable reduction in durability. As with travelpacks it is well worth spending the time in store to make sure that the pack is adjusted to suit you. Probably the largest single category in the rucksack section as there are so many different options. These hiking packs roughly between 20 and 50 litres which will hold the essentials for a day out in the hills. People who are obsessive about cutting down on weight also use the larger examples for weekend camping trips. These feature all sorts of fabrics and most have an internal frame. Some have an adjustable back but this is less important than for the larger expedition packs as the load carried will usually be much lighter. 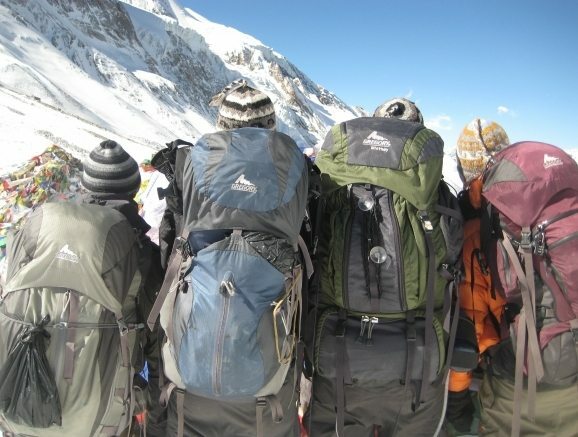 Most of the bags in this sector have straps to attach gear such as trekking poles externally and some have pockets for a snow shovel, hydration systems, sleeves for ice tools and so on and so on. There is however no need to pay for a snowboard holder if you plan on hillwalking around Connemara so be careful when choosing as there is no advantage in being over equipped. Back panels on pretty much all decent walking packs feature some kind of moisture reducing fabric to help keep you feeling a bit less soggy during the day. When purchasing a day pack try to have a good idea of what you will be doing with it. Keep in mind the features that you consider important and try on several packs all with some weight in them. Everything feels great empty. Stroll around the shop with some pack weights or climbing ropes inside the bag to get a feel for how it sits. Get your options down to a couple of possibilities and you can compare one directly against the other and see which you prefer. One good thing about the plethora of choice available is there are no terrible options on the shelves these days. If you find it hard to make up your mind take reassurance in knowing that all the top brands produce really well designed, well-made packs. These alpinist packs are really a subset of technical day packs and can be further divided in to packs designed specifically for rock climbing and those intended more for snow and ice routes. Fabrics or usually lightweight ripstop nylon or polyester with a bit of reinforcement on high abrasion areas. The size range varies according to the length of route, gear required and remoteness from civilisation. A winter route in Alaska would require a larger amount of equipment and therefore a bigger pack than a summer ascent of a route in Glencoe. Often it will be possible to remove the waist belt from a climbing pack so that it does not interfere with the climbing harness. Back systems tend toward the simple as ventilation and comfort are subordinate to weight and stability. All climbing packs have the option of lashing stuff on the outside. Be it ropes, crampons, axes, shovels you name it. This allows a bit of flexibility in packing and load carrying and gear which may be required in a hurry can be kept on the exterior of the pack for ease of access. At it’s most basic these day packs/urban packs are just a bag with a couple of shoulder straps. These are for day or half day walks with enough space for lunch, rainwear, first aid pouch and some miscellaneous bits and bobs. Some will have extra pockets; a padded back, most have padded shoulder straps and occasionally a waist belt which is often just a nylon strap of limited purpose. These lack the high tech wizardry of some bags but are robust, effective and useful for life in general away from the hills. Every day people can be seen using these daybags for gym gear, shopping, for school, for work papers, for laptops and a host of other things besides. Affordable versatile and effective at a budget price. Small lightweight rucksacks containing a reservoir for drinking water. For drinking on the move and keeping your hands free the bladder is connected by a tube to one of the shoulder straps and a bite valve allows the user to stay continuously hydrated throughout the day. Most of these have small pockets for energy bars or other snacks and keys. Sizes normally run from one to three litres with two being most popular and three used by people who travel in hot dry climates were drinking water might not always be readily available. •Many packs come as standard with these light wraparound rain covers made from proofed fabric but if not they are an easy way to improve the weatherproofing of your bag. •Spread over the seams in the rucksack periodic application prevents leakage through the stitching. •Organise the contents of your bag more easily and keep related items together using coloured stuff sacks and organiser pouches. Great for preventing toiletries from meandering around the inside of your rucksack. Take a look at the video below from Deuter for tips on packing your backpack.